In October 2014 S.U.R.E. launched a major fundraising campaign targeted at raising £500,000 by March 2017 to purchase a new Big Bore CT Scanner/ Simulator for the Radiotherapy Department at the Beacon Centre as the existing machine provided by SURE when the Beacon Centre opened in May 2009 will reach the end of its life in 2017. 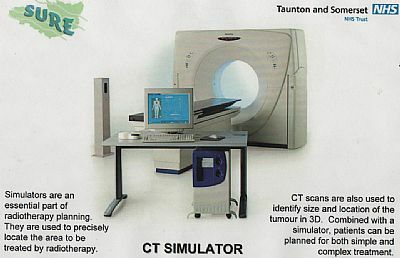 The CT Scanner/Simulator is the first step in planning all radiotherapy treatment, it is used to accurately locate the tumour, providing the input to the planning system so that an individual treatment plan can be drawn up. Replacement in 2017 is essential if we are to avoid patients having to travel to Bristol for this first stage in their Radiotherapy treatment. The new CT machine will incorporate all the features of the current equipment plus OMAR (Orthopaedic Metal Artefact Reduction) type software and any other new developments deemed of benefit to patients at the time of purchase in 2017. Raising £1/2M in two and a half years will not be easy but SURE supporters continue to amaze everyone with their fundraising and prove that a community led charity can achieve whatever they set out to do. The total cost to S.U.R.E for this machine will be £500,000. This is the target for S.U.R.E., with your help we can reach this goal! There will always be advances in technology in the fight against cancer and S.U.R.E. aims to help deliver these. S.U.R.E. wants All Somerset patients to have the very best treatment technology can offer. Please Continue To Support S.U.R.E.